This new series offers the best conditions for challenging turning or milling operation and is designed primarily for heavy duty turning/milling operation with great mass production efficiency. The T8 series offers three combinations for varieties of mass production given better access to the turret and 8” or 10 “ chuck and also efficient chip removal. This series packed with sub spindle and BMT turret with 12 stations which can be additionally equipped with driven tools on six stations. In connection with the driven tools, the main spindle is C-axis functional for accurate positioning. 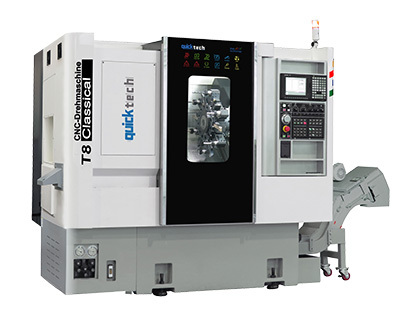 The T8 series offers ditterent combinations for varieties of mass production given better access to the turret and 8” or 10 “ chuck and also efficient chip removal. The guide ways are rectangular box section to maintain rigidity in prolonged operation. This high rigidity structure ensures high machine dynamics and superior machining accuracy. 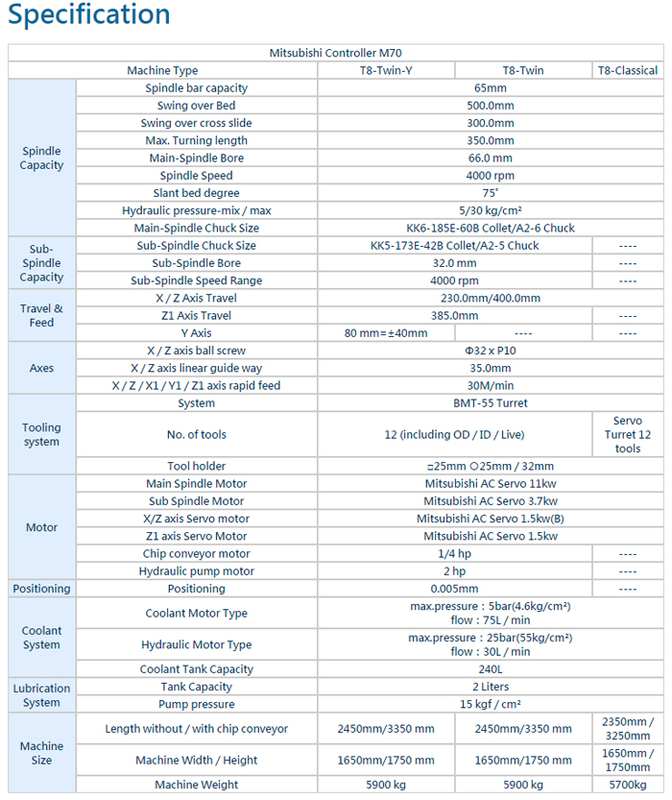 Furthermore, all the axes equipped with 32mm diameter C5 class high precision ball screw, mounted with double ballscrew support bearing ( P4 class), assures high positioning accuracy and backlash free transmission. The standard slant-bed machine packed with servo turret with 12 stations and programming tailstock. It offers the great cost-performance for efficient turning operations for chuck parts.